Armored vehicles take up most of a country’s allocation of military funds. Some enthusiasts created an armored vehicle, which is quite green. Now you must be wondering how a tank, an armored vehicle can go green. It can, when it is run on human power. You can pedal this panzer all across the country and not waste natural resources or spend a bomb. And it is nothing like the Pentagon is going to gift you with one of their super-tanks. 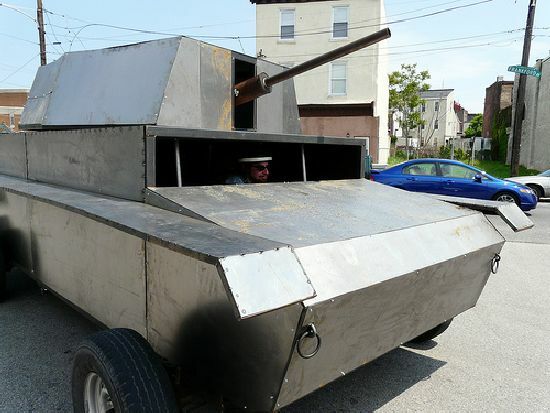 This human powered panzer kampwagen was built in just 11 days and the guys took part in the 2nd annual Kensington Kinetic Sculpture Derby. The guys had planned to crash the Kensington party but were too tired after all that pedaling. The vehicle is now installed as an exhibit on the west side of Frankford Ave in Philadelphia. This panzer surely is going to make many people wish they owned it.